NEIST Jorhat Recruitment 2018 latest notification is out for filling up various vacancies. 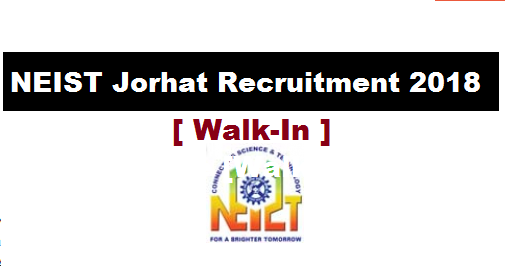 According to the recruitment North East Institute of Science & Technology (NEIST), Jorhat has looking for a few Project Workers with the following specialization on temporary basis. Interested and eligible candidates may appear in walk in interview on 07-02-2018 at 09:30 AM onwards. Following are the details of the posts under North East Institute of Science & Technology (NEIST) Jorhat Recruitment 2018 with post details, number of vacancies, age limit, salary, required qualification with application details. Age Limit: Candidates maximum age should be 30 years. Age Limit: Candidates maximum age should be 28 years. Educational Qualification: Candidates must have 1st class M.Sc in Organic Chemistry, Agriculture, Botany, Bio-tech, Tissue Culture, Life Science for Post 1, M.Sc in Bioinformatics for Post 2. Mode of Selection : Candidates will be selected on the basis of interview. Interested and qualified candidates may attend for walk in interview along with application, original testimonials including mark sheets and certificates with photograph on 07-02-2018 at 09:30 AM onwards. a) Date & Time of Interview: 07-02-2018 at 09:30 AM onwards.